Our largest conferencing space at Girdwood is our main community hall. The room boasts fully integrated AV and sound system with 6m x 4.5m projection screen. Three different style of microphones can be linked up to the wall mounted speakers, three fully fixed, two roving and two lapel microphones can be hired. Two moveable lighting rigs over the stage can be altered in both colour and height. The conference hall has custom built staging that is ideal for drama productions, concerts and conferencing. The staging is 0.45m high and extends out 4 x 8m in front of the projector screen. There are 340 rectractable seats ideal for sporting, cinema, theatre and community events. The shared space is the most versatile space within the hub and has hosted a range of different events from mini conferences to seminars, press launches, exhibitions/ information days and forum meetings. The shared space has a fully moveable wall which can be pulled back if a more open networking space is needed for an event. This multifunctional space comes with a fully integrated AV system and has a 2.3 x 1.7m drop down projection screen. Two fixed microphones and two lapel microphones can also be used for small- medium sized conferencing events and it also has built in Free Sat, Blu Ray and CD player. The shared space can be set up in a variety of layouts such as cabaret, theatre, U shaped and boardroom with a theatre style capacity of up to 120. Our new gym offers a relaxes friendly environment for all the community; and if you need a helping hand or want advice on technique, workout or general wellbeing our instructors and team are here to help, including a free induction session on your first visit, and then free refocus sessions at any time to ensure you are constantly on track to reach your goals. The Gym at the Hub is fully kitted out wiht the latest Matrix equipment, addressing all your fitness requirments- from cardiovasular machines sich as treadmills, rowers, crosstrainers, to a full range of fixed resistance equipment as well as free weights area including a squat rack and benches. The gym also boasts a stretching and functional area with fitness aids such as kettle bells, swiss balls and med balls. With so many activites going on in our centres, thiss gives you the perfect opportunity to find out what esle you can get involved in. 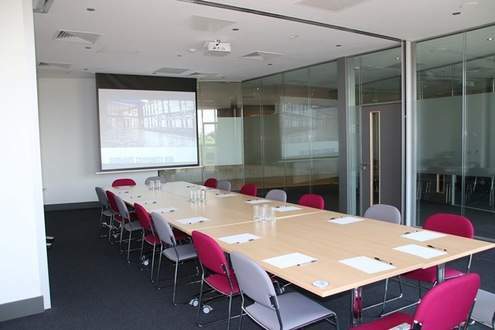 The Centre offers two conference rooms which are perfect for hosting training days, briefing sessions, presentations, senior management meetings and small workshops. Both rooms are decorated to a high standard and catering contacts can be provided should you wish to offer your delegates food. Tea / Coffee and Water can be provided in house on request. The rooms can be organised for board room style, theatre seating or communal horseshoe ring for face to fact conversation around a leader. A drop down screen and fixed projector are standard in both the larger rooms along with Wi Fi access. Flip chart stands are also available. Seating capacity board room style is 24 in the larger meeting room and 16 in the smaller meeting room. Both of the rooms can be subdivided to make 4 smaller rooms. Rooms are situated on the first floor and are accessible via the stairs or lift. Toilets facilities are also close by. Why not combine your meeting with a team building session in our studio or fitness suite. We are also able to offer a our spa facility, designed to enable your delegates to relax and unwind. Our Better studio here at Girdwood Community Hub has many unique features that can support a multitude of activities. To Find out the features and facilities it can host please do not hesitate and click the picture above to find the ideal space for your needs. Lift your spirits and pamper yourself with a visit to our welcoming spa where you will discover a relaxing experience at an affordable price.